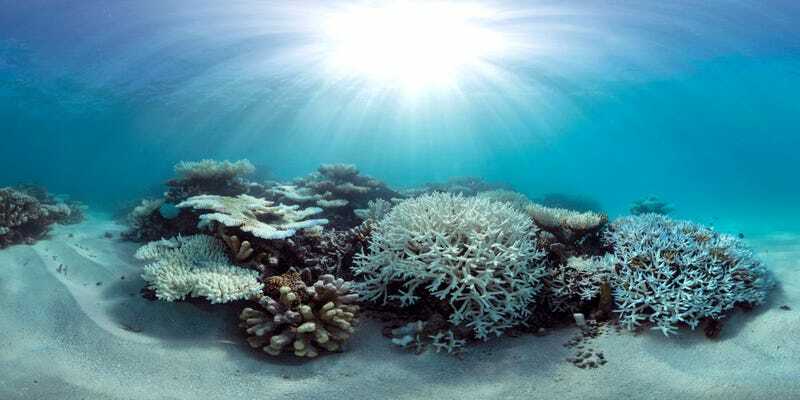 Coral bleaching occurs when ocean water is too warm, and corals expel the colored algae living in their tissues, a process that turns the coral completely white. Corals can survive a bleaching event, but it puts them under greater stress, making them vulnerable to further damage and death. A healthy, resilient reef can resist a stressful event, like bleaching, or recover from it, but only if temperatures quickly return to normal. Ehsani’s proposal is simple, low cost and potentially sustainable. It would use energy generated by ocean waves to pump cool water to the heat-stressed corals through a durable, lightweight pipe he designed. “There is an endless supply of cool water just a short distance away, at the bottom of the ocean,” he said. “The heating of the water comes from above — from the sun beating down on the ocean.” He explained that surface water heats up faster than the rest of the ocean. It’s also cheap. Large diameter pipes “are not easy to make with conventional techniques and are extremely expensive,” Ehsani said. His fiber-reinforced polymer pipes are more cost-effective. His pipe is made by the company he founded in 1994, QuakeWrap. The technique involves wrapping fiberglass or carbon fiber around a steel mold in the shape of a tube. During wrapping, the fabric is sticky and flexible. Upon heating, however, it hardens and can be slipped off the mold to become a pipe. “The technique we have developed allows us to make it in any diameter we need,” he says. Ehsani has been working with fiber-reinforced polymer products since the late 1980s. He left academia in 2010 to devote more time to his company. He has designed other products used by construction firms to repair high-pressure pipelines, freeway underpasses, marine piles, historical structures and more. One of his products received the American Society of Civil Engineers’ 2016 Innovation Award for being the world’s first green and sustainable pipe. He acknowledges there still is much to be done before the system will be ready for deployment. Researchers must calculate the size of the reef, measure the temperature of the water and determine what size pipe is needed. Nevertheless, “I think there is enough merit for somebody to support a study,” he said. Ehsani is hoping to draw the interest of Australian officials for a pilot project in the Great Barrier Reef. Scientists say Australia’s national treasure has already suffered massive coral death and damage from bleaching. The Great Barrier Reef is the world’s largest coral reef ecosystem. It’s comprised of more than 3,000 reefs and contributes more than $5 billion annually to Australia’s economy. While he has not contacted Australian officials directly, he has reached out to Australian scientists with the hope of collaborating with them. “I’m hoping that the news of what we are doing reaches the right people who want to look into this and let us be a part of a study,” he said. Scientists are investigating a number of solutions to preserve coral reefs. A team of Australian researchers hopes to genetically engineer the microalgae found in corals to enhance their tolerance to ocean warming. “It’s really sad when you look at the discoloration. They are just dying,” Ehsani said. “This is our planet, and we are messing it up and not taking care of it. We have a moral obligation to try to restore the reefs to their original condition and stop the destruction.